I have a problem. I take a lot of photos. Mostly of food (duh), but I also have lots of photos of family. Where do I keep them all? On my hard drive. Where no one can see them. Sure, sometimes, they’re uploaded on Facebook, but that’s not exactly the best use of some of my favorite photos. So when I recently received a complimentary canvas print for review from EasyCanvasPrints.com, I was pretty excited. 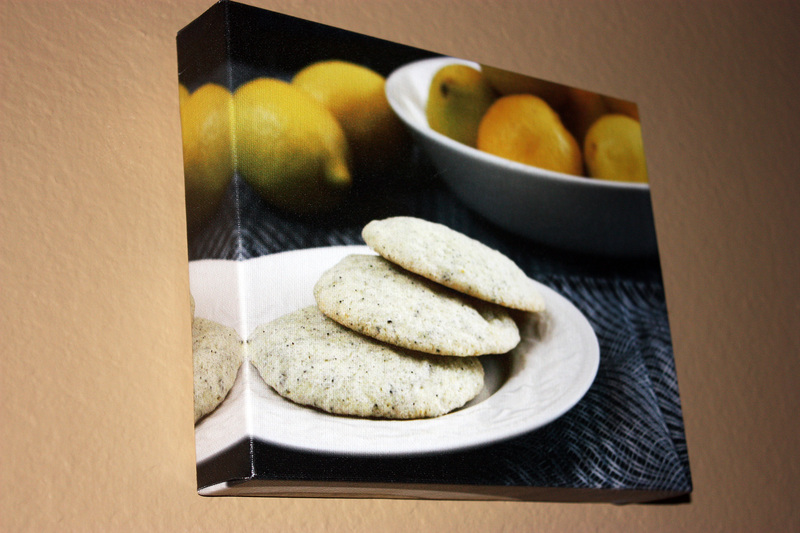 I opted to have one of my photos printed on canvas to decorate our kitchen. 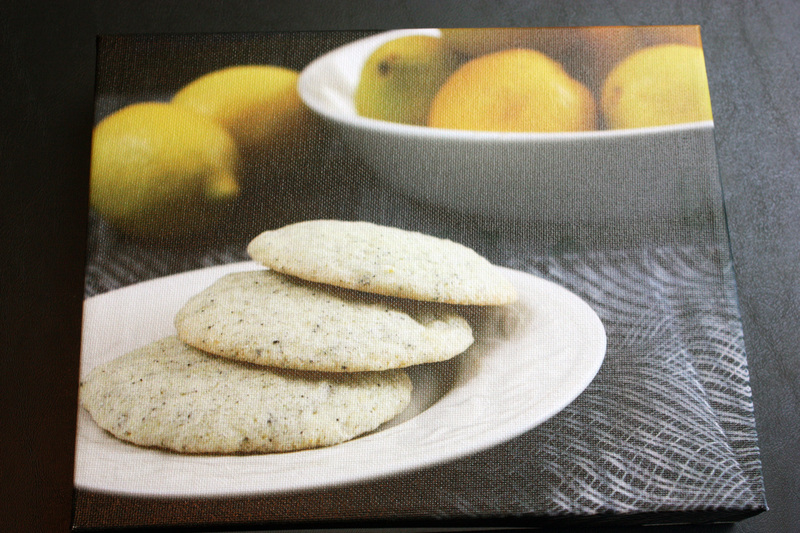 (I chose the photo used for these Lemon Earl Grey Cookies I made earlier this year.) I’ve been meaning to hang some of my photos around the house, and this gave me the kick-start I needed. Just check out this canvas. It has wonderful quality – it looks so professional, and you can choose to have the photo wrapped around the sides of the canvas, or have a solid edging in any color you wish. I was so impressed with this canvas. It’s now hanging on a small wall in my kitchen, so every time I walk in, I can admire it. My canvas on my wall! I also love that this company is (somewhat) local to me – they’re based out of Austin, Texas. Texans gotta stick together! This would be a great opportunity for you to clean out that hard drive (c’mon, I know you have more than a few photos just knocking around on there) and be proud of your favorite photos. It’s easy to do. It’s also a great idea for a gift. Have photos of your children? Grandma would LOVE to have them on a canvas print! The possibilities are endless. Me? I’m contemplating taking some amazing photos the next time we travel, and blowing up my favorite one to hang on our wall. That way, we can be reminded of a great time every day. Winners of Lindsay Olives and Whole Foods Kosher Kitchen Giveaways! Alright, I know you’ve been dying to know who the winners of the Lindsay Olives giveaway and the Whole Foods Kosher Kitchen giveaway were! 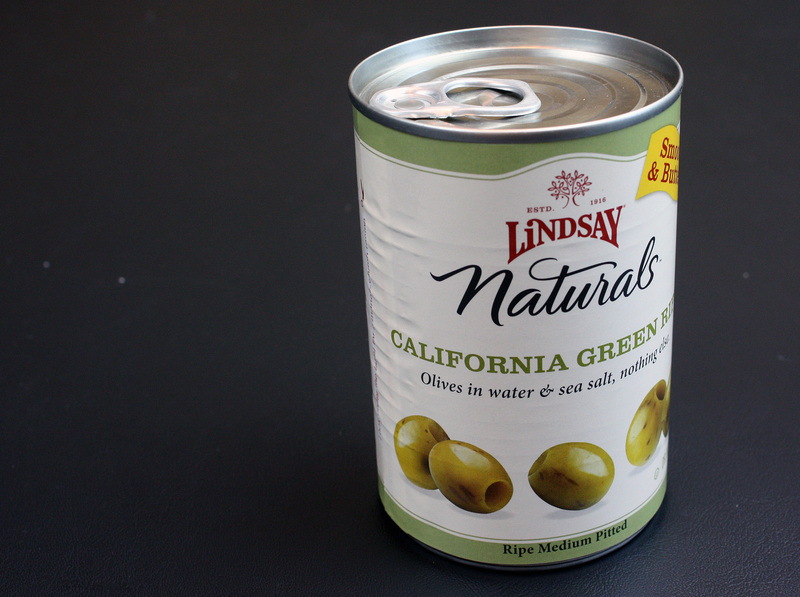 The winner of the Lindsay Olives giveaway is Iris of The Daily Dietribe! Congrats Iris! Congratulations to the winners! Winners, please email me at alta2924 at hotmail dot com with your mailing address. 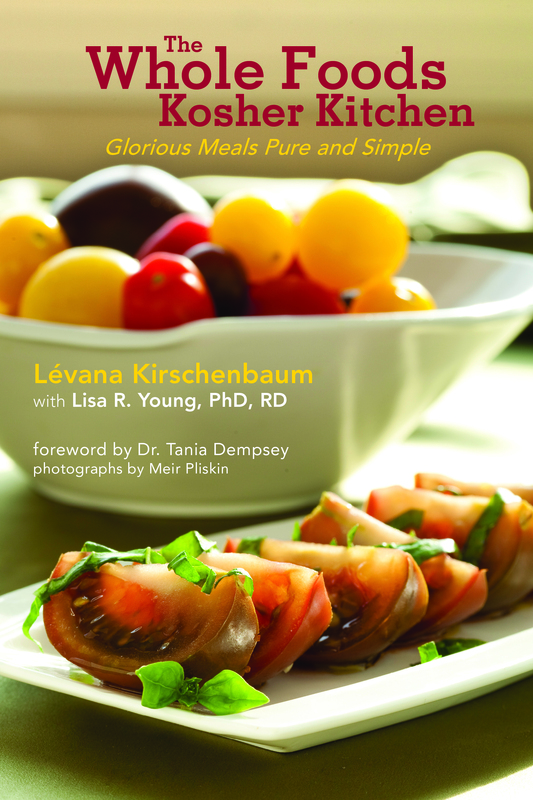 The FIVE winners of the Lauren’s Gourmet giveaway have been chosen, courtesy of random.org! To the winners – I’ll email you, but if you haven’t received an email, please contact me and I’ll get the baking mix of your choice to you! Want to know who the winner of the free copy of Good Morning! 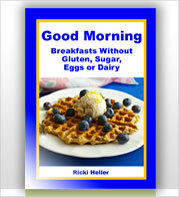 Breakfasts without Gluten, Sugar, Eggs or Dairy by Ricki Heller is? Christy, I think you’ll be more than pleased with Ricki’s breakfast ideas. Congratulations! 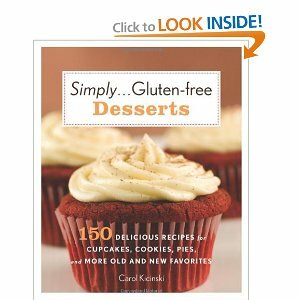 The winner of Simply…Gluten-Free Desserts by Carol Kicinski is…..
Carol, you should have received an email from me, but if not, please contact me and I’ll get the book out to you right away. Congratulations! Diane over at The W.H.O.L.E. Gang is hosting an incredible series during the month of May called 30 Days to Easy Gluten-Free Living. This series came about during a conversation among several of the gluten-free food bloggers. We decided that we were tired of hearing the same old complaints about the gluten-free lifestyle – that it’s really complicated, the food is horrible, it’s expensive, etc. (In fact, I even once had a gastroenterologist tell me that the gluten-free diet is expensive!) These are gripes that are heard over and over among those people that must eat a gluten-free diet. The thing is, none of these complaints are absolute truths, and that’s what this series is all about – to help you learn how to live gluten-free easily (and frugally). Today, I’m sharing some easy gluten-free solutions to those old standbys in the Standard American Diet (S.A.D.) – convenience foods. Convenience foods can include everything from fast food and take-out, to frozen dinners, to packaged, pre-processed, or otherwise frankenfoods that fill up many a pantry and refrigerator throughout our country. Theses foods are not only commonly filled with gluten (which we said “goodbye” to on our gluten-free diets! ), but also many times are loaded with sugar, corn syrup, refined flours, hydrogenated fats, and unpronounceable mystery ingredients, such as preservatives, artificial dyes, flavors, and other unnatural substances. These aren’t good for anyone’s body, but for someone that is healing a sensitive digestive system or other adverse effects from gluten, they can definitely slow the healing process. But even those with the best of intentions know that the reason we reach for these foods is that they’re so gosh darn CONVENIENT! When we’re busier than ever with our lives, running from one task to the next, going to school, work, then homework, taking kids to 5,000 different places, and of course, trying to keep our home in some type of order, we all wish for meals to be as convenient as possible. How do you meet this goal and incorporate gluten-free living at the same time? Make your own “convenience” foods! Sounds counterproductive? It doesn’t have to be. With a few key tools at your arsenal, you can make some convenience foods for you and your family that can be available when you need them most – during those times when you literally have just a few minutes to prepare your meals. With a bit of planning, and the use of some of these ideas, you can transition those old convenience foods out of your pantry for better-tasting, better-for-you homemade “convenience” foods. Cook In Bulk – Make large quantities of dishes, and freeze individual portions. Then you can have your own homemade “frozen” dinners available for convenience. 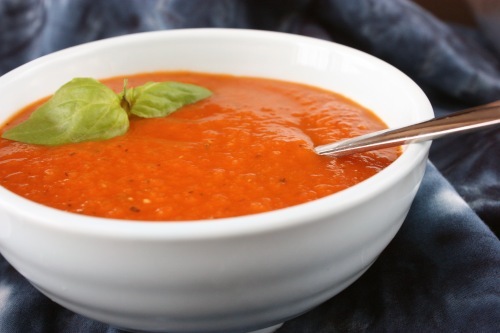 Many soups reheat particularly well, and make great lunches. I do this on the weekends, when I have more time to cook, but I also tend to use my slow cooker to cook large portions both on weekends and weekdays. If you don’t have a ton of freezer space, you can also cook in bulk for just the coming week or a few days. For instance, you can hard-boil eggs for breakfasts, lunches or snacks for the coming week. 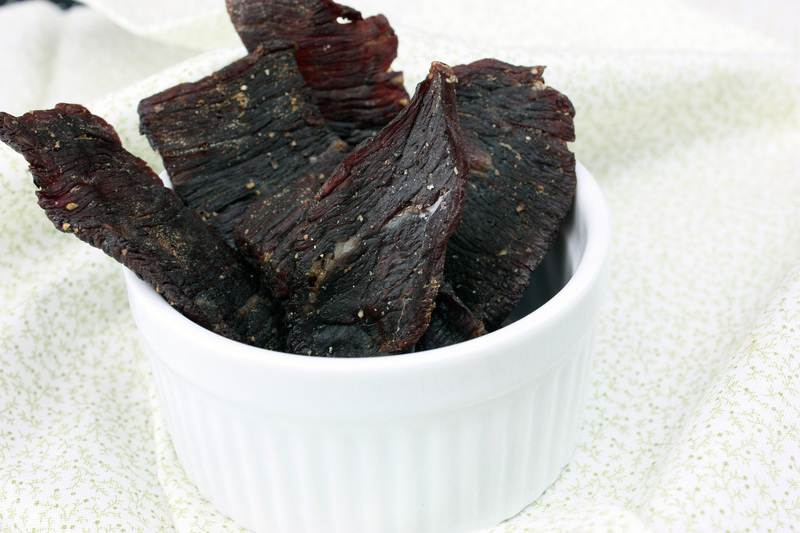 Make beef jerky for snacks, either in a dehydrator or the oven. Cut up carrots, celery, broccoli, cauliflower, or any other raw veggie and divide into individual containers or ziploc bags for snacks or lunches for the week. (While you’re at it, if you have fresh vegetables on the menu for various other nights of the week, wash, peel, and prepare those vegetables for your recipes too, to save yourself time later!) Bake a batch of muffins, and individually wrap them for the week (muffins tend to freeze well too!). Make a batch of gluten-free oats, cream of buckwheat, quinoa flakes, or whatever porridge your heart desires, and store it in individual containers for the week. The more batch cooking and preparation you can do, the more time you’ll save when you’re having a hectic day. Just an hour or two in the kitchen on a Sunday can save your sanity on a busy Wednesday night. 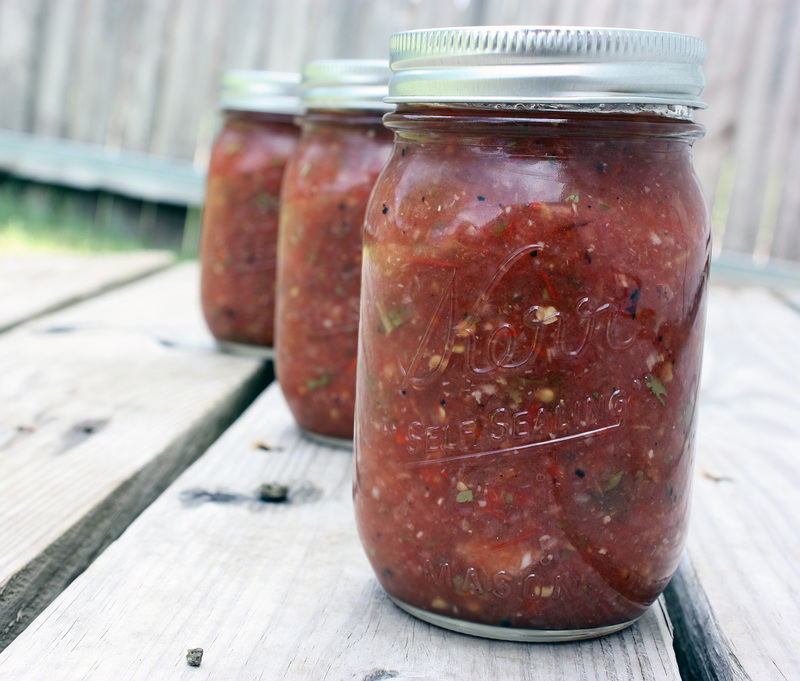 Make your own condiments and “base” ingredients – Many condiments aren’t gluten-free, their gluten-free status is dubious, or they’re otherwise filled with corn syrup, sugar, or other processed ingredients. Does this mean we should do without? Of course not! Try your hand at making your own! I’ve fallen in love with making my own salad dressings, ketchup, pumpkin puree, nut butters, and even jams, jellies, and salsas. You’ll find when you start making your own that they taste better, fresher, and many times are cheaper to make. For example, I can find whole almonds for $5 a pound on sale, sometimes less. Try finding a 16 oz. jar of almond butter for the same price. Besides, when you make it yourself, you can customize the amount of sweetener and/or salt added, and can experiment with all sorts of nuts. 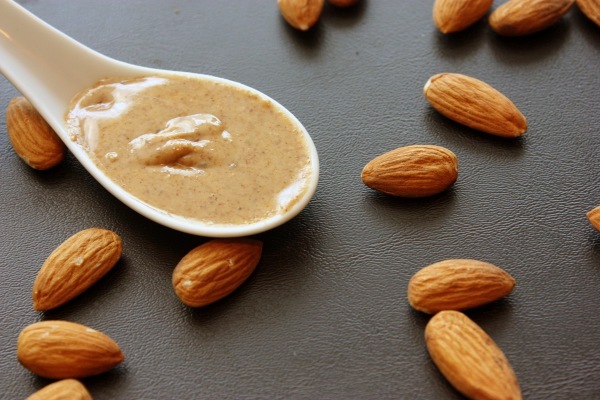 Cinnamon walnut butter, anyone? Gluten-Free Convenience Foods that are Relatively Free of Processed Ingredients – Generally, whole, fresh, unprocessed foods are best, and most of the time, that is what we eat in our home. It makes gluten-free living so much easier and less expensive. But there are a few “boxed” ingredients that are relatively free of preservatives and processed ingredients, and these ingredients can help streamline the meal-making process. I often keep these kinds of things on hand in my pantry, as “emergency” items, in case plans fall through. Come to think of it, if you combined a few of these above items, (for example, top minute brown rice with a bag of mixed steamed frozen vegetables, and drained and rinsed beans, warmed and seasoned to taste) you could have a gluten-free meal in a few minutes. How’s that for convenient? Of course, with a little creativity, your options for convenient meals can be endless. Shirley over at Gluten-Free Easily has come up with an even more comprehensive list of convenient foods that are gluten-free, called 50 Gluten-Free Foods You Can Eat Today. There you have it. Gluten-free can be more convenient than the masses would lead you to believe, and at a fraction of the price of those packaged, less-than-tasty gluten-free cookies, cakes, crackers, and other treats at the grocery. Making your own convenience foods can be healthier too! Tuesday May 3rd Iris from The Daily Dietribe sharing on How to Start a Gluten Free Diet. Monday May 9th Amy from Simply Sugar and Gluten Free sharing Magic Cookie Power Bars. Saturday May 14th Brittany from Real Sustenance sharing Healthy Allergy-Free Quick Bread with easy flavor variations. Friday May 20th Silvana from Silvana’s Kitchen sharing Everything I’ve Learned So Far about Gluten-Free plus my Dairy-Free Nutella Knockoff recipe! Saturday May 21st Maggie from She Let Them Eat Cake sharing Easy Gluten-Free Living With Preschoolers and a Vanilla Cupcake recipe! Sunday May 29th Kelly from The Spunky Coconut sharing Buying in bulk to save money, Cooking in bulk to save time. 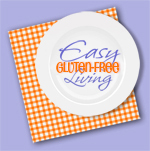 Monday May 30th Rella from Penny Pinching Epicure sharing Gluten Free on a Budget. Tuesday May 31st Naomi from Straight into Bed, Cakefree and Dried sharing how to prepare grains so they are more nutritious & digestible and create fluffier wholegrain baked goods! 2010 feels like a whirlwind of a year to me. Doesn’t it to you? This has been the first full year that Tasty Eats At Home has been gluten-free, and I feel like I’ve learned so much about gluten-free living, baking, and health in that time. 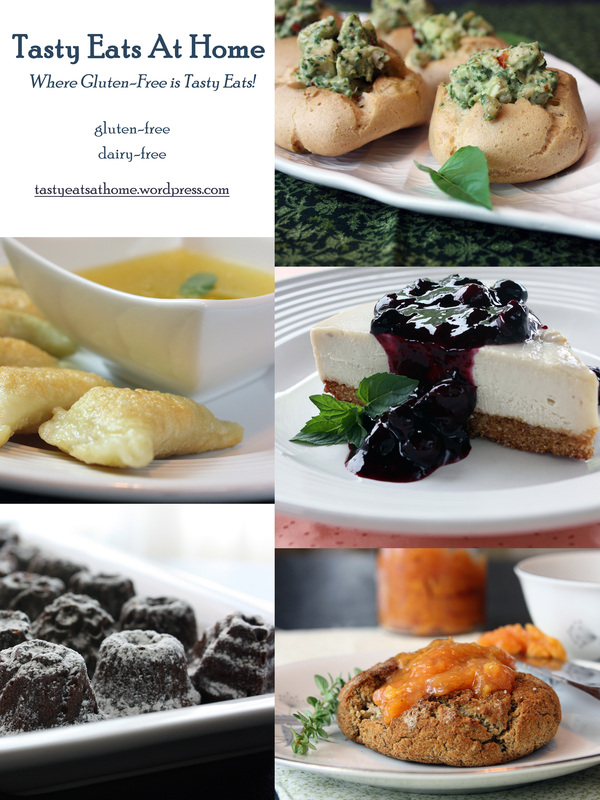 Tasty Eats At Home has become dairy-free as well. Still, there is so much left to learn, and so much left to do. I took a look at my resolutions I posted at the end of 2009, and while I’ve accomplished a few, I realize I still wish to tackle some of those goals! But first, let’s review some of your favorites from 2010. These are all tasty recipes – and run the gamut from quick-and-easy dinner recipes to yummy sweets. Slow Cooker Pot Roast – I have come back to this recipe time and time again for an easy solution to dinner. Quinoa Salad with Spinach, Raisins, and Walnuts – a healthy, light way to enjoy a quick meal. Jap Chae – This is one of my favorite quick meals, and it’s completely vegan. Talk about satisfying without the guilt! Banana Chocolate Chip Muffins – I’ve made these multiple times since posting this recipe. A treat for kids and adults alike! Gluten-Free Oatmeal Raisin Cookies – A favorite of mine from childhood. Yum. Gluten-Free Churros – These were fun, and I kid you not, our kids have requested these for Christmas morning next year. Guess they were a hit. Chocolate Ice Cream – Need I say more? Who doesn’t like chocolate ice cream? To make it dairy-free, simply use coconut milk and another dairy-free milk. I’ve made all-coconut milk ice creams before – they’re so creamy and decadent! Gluten-Free Brownie Bites – Brittany just made these a few weeks ago, and they’re wonderful. We made them dairy-free by substituting 7 tablespoons of palm shortening for the 8 tablespoons of butter. Easy peasy, and SO worth it. Masala-Spiced Adzuki Beans and Rice – I think it’s time to make these again, especially once the holiday overindulgence has occurred. The dish is vegan, packed full of protein, and comforting. Flourless Almond Butter Cookies – Another easy-to-make treat! Who doesn’t love cookies, and these can be whipped up with just a few ingredients. And what was my favorite recipe of 2010? It’s hard for me to choose! Here are my top 10 that I truly enjoyed. Peach and Kumquat Crostada – I loved the crust here, and this was a perfect ending to a heavy meal. Gluten-Free, Vegan Broccoli “Cheese” Rice Casserole – I was so excited when this was just as tasty as the original! Texas Chili – This is my “go-to” recipe for chili. I made some for Christmas day, actually, using venison. (Yes, we had chili on Christmas. Long story, but we had our traditional Christmas dinner the day after, so chili was the meal for the actual holiday.) Talk about yum. Curried Acorn Squash, Sweet Potato, and Apple Soup – a delicious and healthy soup; one of my favorites made this year! Vegan Cheesecake with Blueberry Compote – I was ecstatic when this turned out. Cheesecake is back on the menu! Gluten-Free Sweet Potato and Pork Pierogies – These were phenomenal. I think I should treat my husband and I again to these! Perfect Lamb Chops – If there’s one dish that was enjoyed over and over again in our home this year, this would be it. Something that’s delicious and easy? Yes, please! Moist and Herb-y Turkey Burgers – Another healthy dinner recipe that’s sure to make its rounds on our menu soon! Ratatouille – If there was a vegetable that I truly fell in love with in the past year, it would be eggplant. This is one dish that truly makes eggplant sing. Croquembouche – If there was ever a Daring Bakers Challenge that I had to conquer, this was it. I had multiple failures before this dessert finally worked, but when it did, it was heavenly. Whew, that was harder than I thought! Apparently I am quite attached to a lot of my posts. And most of all, I’m curious: What would you like to see on Tasty Eats At Home? I’d love to read some feedback – more healthy recipes? More desserts? Easier layout, search functions, etc? Let me know! Happy New Year to you all. I hope you have a safe, healthy, happy, and prosperous 2011!